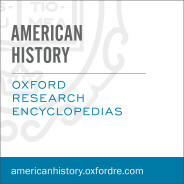 Substantive, peer-reviewed, and regularly updated, the Oxford Research Encyclopedia of American History combines the speed and flexibility of digital with the rigorous standards of academic publishing. He is stupid and lazy. He has the attention span of a child. He caters to racism and he does not respect women. His patriotism is juvenile and belligerent. He claims to have the common touch, but he truly cares only for the rich. Is this the standard bill of indictment against Donald J. Trump, circa 2016—or against Ronald Reagan, circa 1980? Of course, these charges were made by liberal opponents of each. Many were made of George W. Bush as well: they form a well-worn package of accusations that have stuck to almost every successful Republican presidential aspirant since the Watergate crisis of the 1970s. To Democrats and progressives, this is what popular Republican politicians are like. This is not just a potentially devastating set of charges, but also, ironically, a conservative formula for winning. Some of the claims about each man were supported in fact, while others were merely self-serving liberal insults. Trump’s harsh anti-Mexican nativism and his Islamophobia, like his alarming relationship with the neofascists who call themselves the “alt-right,” represent a true break from anything purveyed by Reagan or the second President Bush (although each of those men had things to answer for in their appeals to white resentment, their preferential treatment of the rich, their callousness toward the poor, and their scant concern for the human cost of war). Yet of all recent Republican standard-bearers, the one whose presidential campaign stands out as the most shockingly exploitative and hateful is the one who figures least of all in liberal narratives of Republican moral decline. That is the first President George Bush. George H. W. Bush, rejected in his bid for a second term in 1992, is the only post-Watergate GOP president who did not excite the full list of outraged condescensions provided above. In a way, Bush I is the key to understanding the steady recipe for Republican presidents in our age, precisely because his fractured popularity makes him stand out from the rest. The elder Bush’s greatest political success was the grossly race-tinged campaign that he ran in 1988, which elevated him to the Oval Office. Battling the “third-term curse” that inhibits one party from holding the White House for twelve years running, Bush, after Reagan’s two terms, knocked the political system on its side—and knocked his Democratic opponent, Michael Dukakis, to the canvas. 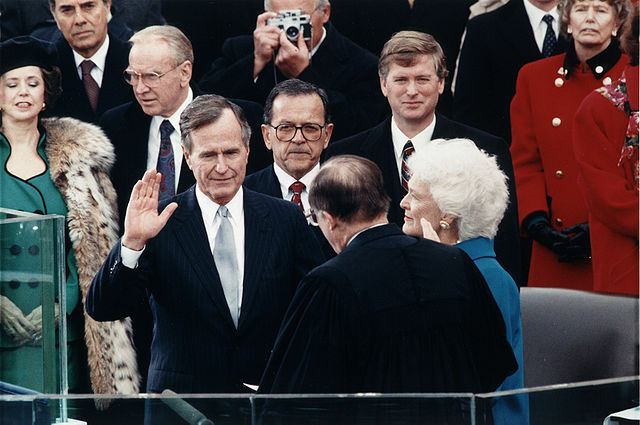 Chief Justice William Rehnquist administering the oath of office to President George H. W. Bush on 20 January 1989 at the United States Capitol. Public Domain via Wikimedia Commons. Bush set new terms for the contest. Instead of debating the mixed economic legacy of Reaganomics and the increase in poverty, homelessness, and inequality that the policies of the 1980s produced, the candidates in 1988 jousted over who was a more determined foe of rapists and murderers, and whose patriotism was purer. Bush made “Willie” Horton—who fled a prison furlough and raped a Maryland woman while serving time in Massachusetts for murder—the centerpiece of his presidential bid. Widely circulated photographs ensured that all Americans were reminded Horton was black. The fact that the woman he assaulted was white was, it seemed, universally understood. Far from shying from this particular case because of the incendiary potential that lay in these details, the Bush campaign appeared drawn to the story, partly for this reason. The other major campaign issue for Bush was his charge that Dukakis was unpatriotic because, as Massachusetts governor, Dukakis had vetoed a rather plainly unconstitutional bill that would have required public school teachers to lead children in the Pledge of Allegiance (members of minority churches were the teachers likeliest to object; Bush was not greatly concerned over their religious liberty). Dukakis—nearly struck dumb by Bush’s tenacious and successful effort to make the Democrat the candidate of rapists and flag-burners—became political road-kill. Surely we also should remember that Bush’s record of governance as president was more moderate, in many areas, than Reagan’s had been. Bush was less hostile to environmental regulation than Reagan had been, and he signed the Americans with Disabilities Act. Most of all, his willingness to tack toward the center on tax policy, in order to close a gaping public debt, cost him greatly in Republican support. When he appealed to the voters, Bush’s main political vulnerability lay in his image as an effete aristocrat. His elitist persona was linked to his uncertain conservative credentials. To conservatives, Bush’s policy equivocations reflected his poor connections to the salt-of-the-earth taxpayers whose hostility to the welfare state welded them to the political right. Bush escaped his upper-crust identity briefly with his coarse 1988 campaign, but it lingered, and was turned against him skillfully by Bill Clinton four years later. Because Bush lacked the common touch, he gravitated toward harsh campaign themes and tactics in 1988, in order to compensate for this deficit—as if to prove that he was a true conservative who could touch the movement’s heartstrings. In a way, Bush provided the strongest validation of the liberal claim that the secret of conservative popularity was an appeal to primal fear and base prejudice. One point of information that reveals George H. W. Bush’s importance as a transit point on the Republican journey from the Nixon era to the Trump moment is the role of media guru Roger Ailes in the campaigns of all three men. Ailes, who led Fox News in its meteoric rise in between 1988 and 2016, was always the maestro of hot-button appeals that divided the electorate in ways that redounded to Republican advantage. He was Nixon’s main media adviser in 1968, when he effectively used the issue of law and order in a time of turmoil, and he played the same role for Bush in 1988, pressing the crime issue into newly charged territory. In 2016, Ailes had a less certain role in Trump’s campaign, but Trump’s bold statements of sympathy with Americans who fear Mexicans and Muslims were in the Ailes tradition. That tradition runs like a bright thread through Republican politics from Nixon to Bush I to Trump. The Republican Party’s old guard, including members of the Bush family and their circle, were repelled by Trump in 2016. But this was not a last stand in defense of decency. It was the expression of a will to class dominance against an arriviste who, in his hostile takeover bid, used some of the establishment’s own political tools against it. Featured image credit: “Donald Trump” by Gage Skidmore. CC BY-SA 2.0 via Flickr. Doug Rossinow teaches history at the University of Oslo. He is the author of numerous publications, including The Reagan Era: A History of the 1980s, and “The 1980s” article in the Oxford Research Encyclopedia of American History. How are the claims about the relations to Roger Ailes similar? What were the examples of both Bush and Nixon? I don’t understand if Ailes had any role or if you are claiming that the themes he instilled were carried on or adopted by this regime?